Just an FYI, the Adirondack Phantoms are holding an online Ebay auction for game-worn player jerseys. There is only one day remaining to bid, so act fast. Players include Eric Wellwood, Zac Rinaldo, Kevin Marshall, among others. The team may have seen better days but the sweaters aren’t bad looking. The Flyers did not have to wait until the AHL season got underway for James Van Riemsdyk to suddenly turn it on. 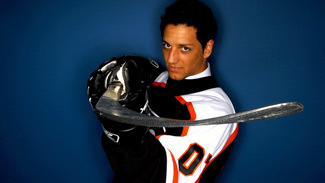 The former second-overall selection in the 2007 draft dominated in the third annual Flyers – Capitals rookie scrimmage, scoring four goals and assisting on one, as the Flyers walloped the Capitals, 7-3, Friday at the Skate Zone in Voorhees, N.J.
VOORHEES — 20-year old Kevin Marshall has seen himself quickly rise to the top of the organization’s prospect ranks since being selected by the Flyers 41st overall in the 2007 draft. The gritty stay-at-home blue liner is armed with a plethora of attractive weapons, including excellent vision, good skating and a nose for physical contact. But one the Quebec native’s most attractive qualities helped come from the advice of Hall of Famer and Quebec Rampart head coach Patrick Roy. For one week, beginning on Sept. 7 at the Skate Zone in Voorhees, N.J., 29 Flyers’ prospects will take the ice for the team’s annual rookie camp. Among the attendees are former second-overall draft pick James van Riemsdyk, defenseman Kevin Marshall, Marc-Andre Bourdon and Patrick Maroon. The Flyers’ prospects will conclude the camp with a scrimmage against the Washington Capitals’ prospects, held at the Skate Zone on Sept 11. On Monday, the greenest Flyers gather in Voorhees, N.J., to begin another week-long conditioning camp. And although camp this year is less exciting than its recent predecessors, it still makes for some interesting story lines.